Dress in a red lace midi dress to pull together a chic ensemble. Brown suede pumps look incredible rounding off this look. Try teaming a blue chambray button down blouse with white jeans for an off-duty and stylish outfit. Let your styling sensibilities truly shine by completing this look with Givenchy brown suede pumps. Go for a charcoal embroidered beaded evening dress and you're bound to make an entrance. For something more on the daring side to round off your ensemble, add brown suede pumps to this getup. A camel coat and olive plaid tapered pants are absolute staples that will integrate well within your casual wardrobe. A pair of Givenchy brown suede pumps is a great option to round off this outfit. The combination of a grey cardigan and green chinos makes for a solid casual look. Brown suede pumps will infuse an extra dose of elegance into an otherwise utilitarian look. Such must-haves as a white crew-neck sweater and black skinny pants are the ideal way to infuse extra cool into your current routine. If you wish to effortlesslly glam up your look with footwear, introduce a pair of Givenchy brown suede pumps to the mix. A camel coat and light blue jeans have become must-have wardrobe styles. Givenchy brown suede pumps serve as the glue that brings this ensemble together. For an off-duty ensemble, opt for a tan wool blazer and navy ripped skinny jeans — these two items fit really well together. 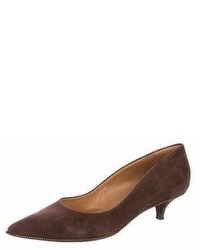 Brown suede pumps are a guaranteed way to inject an air of sophistication into your look. For a casual outfit, rock a brown plaid double breasted blazer with light blue jeans — these two items play perfectly well together. Kick up the style factor of your outfit with Givenchy Suede Pointed Toe Pumps from TheRealReal.